I realize that not everyone knows what green chili is. If you haven’t heard of it, I am happy to be the one to introduce you to it! Green chilies are mild, rather large chile peppers that are indigenous to New Mexico, and we love them. I don’t think you can escape living in NM without growing fond and loving sentiments towards the green chile. 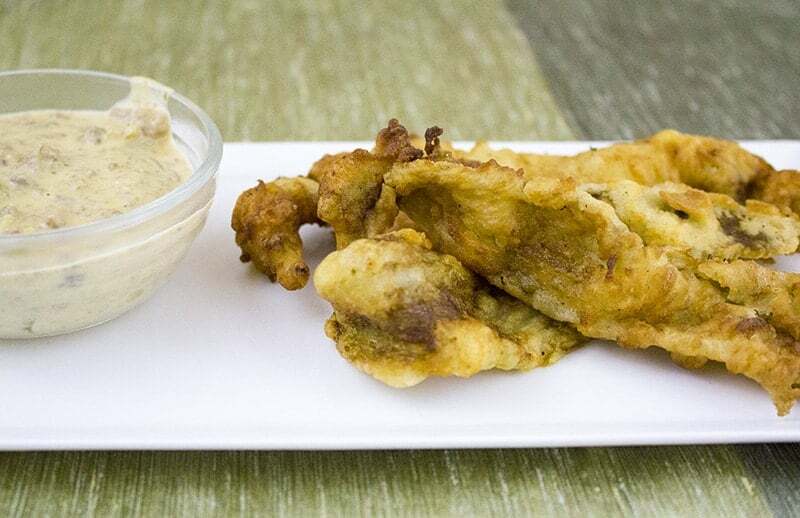 While green chile is splendid in enchiladas, soups and stews, it is amazing when it is dredged in a beer battered and fried (much like every other food on the planet). My husband remarked that they were similar to a chile rellano, without the cheese. He is right, but I think I prefer them this way! Take the whole cooked green chilies, and peel, if necessary. Remove seeds and stem, and cut down the center of one side, so you can lay the green chile flat. Cut vertically into 3 strips, about 1/2″ thick. Heat oil in a large and heavy saucepan or deep fryer over medium heat. You want the temp right around 375 degrees. In a separate bowl, combine a bottle of beer (we used a light beer, but you can certainly be creative here), 1.5 cups of flour, salt, pepper and garlic powder. Whisk together until smooth and all lumps are removed. Dip green chile strips into batter to cover all sides, then dip into remaining 1/2 cup of flour, and then carefully place into hot oil, using tongs. Cook for 30-60 seconds, until the outside is golden brown. Remove from oil and place on a paper-towel lined plate. Repeat process until all green chile strips are cooked. You can serve this with ranch or queso as a dipping sauce. Have you ever tried green chiles before? 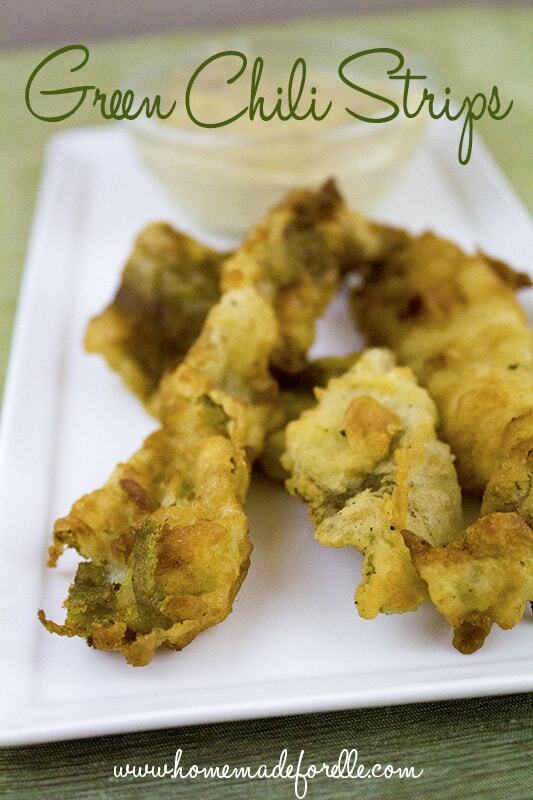 What is your favorite dish to add green chiles to? Can I use some I froze? When you say cook chiles do you mean roast them? Great question! I should definitely make that more clear – yes, cooking chiles would be roasting them. Oh my goodness!!! Y’all these are scrumptious and crispy!! Great appetizer or side for Fall get togethers!! Did the moisture from the chili make it pop in the water?